A double from Great Britain International Ben Davies helped his current side Guildford Flames to a 4-3 victory over his former team, the Genting Casino Coventry Blaze at the Spectrum. The Blaze lined up the same as last weekend, whilst Guildford gave the start to Chris Carrozzi between the pipes with Travis Fullerton and forward Kevin King sitting out. A rare strike from assistant player/coach Kevin Noble put Coventry ahead at 10.26, Tim Crowder with an assist extending his point-scoring streak to 12 games. At 14.27, the former Blaze forward Davies drew the home side level with a delayed penalty goal. 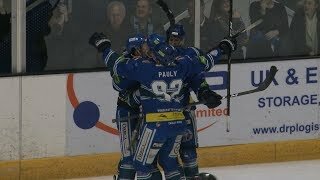 With just 4 seconds remaining of the opening twenty minutes, it was 2-1 as the Elite League’s top point-scorer Kruise Reddick beat Hackett on the powerplay (19.56). Also extending his point-scoring streak to 12 matches at 25.39 was Blaze’s top point and goal scorer vs. the Flames, Ben Lake with his 6th goal and 11th total point in 7 games between the two. Crowder also adding a second assist, earning himself the Blaze Man of the Match award. With his second, Davies made it 3-2 (38.20) after 40 minutes of play. Guildford’s lead was extended to 4-2 at 52.40 with TJ Foster scoring and an assist going to Flames' Man of the Match Davies for his third point. The Blaze weren’t to go away easy though as Justin Hache grabbed one back short handed at 56.24 for 4-3. 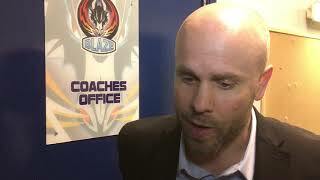 Despite pulling Hackett for the extra skater and having 15 seconds powerplay time to end the game, a come back wasn’t to be as the Flames took an important two points in the Elite League playoff and Patton conference race.